Have you ever struggled to articulate your offering clearly, get people to buy into your vision, or determine the direction of your business? If you answered yes to any of these questions, this post is for you. As some of you know, I have a goal of reading 24 books this year. 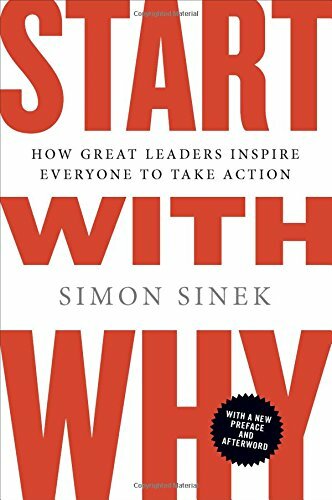 The best one I’ve read so far has been “Start With Why: How Great Leaders Inspire Everyone to Take Action” by Simon Sinek. This book should be required reading for all business owners and entrepreneurs. I first heard of Simon Sinek’s work after watching his 2009 Ted Talk, where he talks about his “Golden Circle” theory. I enjoyed it, assumed I had a pretty good sense of the concept, and then I moved on. Then a friend sent me the full book and told me to read it (thanks, Luis). I often talk to my coaching clients about the importance of knowing WHY they are creating their business in the first place. It keeps them grounded and motivated through the roller coaster of entrepreneurship. This book takes that idea to a whole new level. According to Sinek, most leaders talk about WHAT they do - the products or services that make them money. Some leaders talk about the HOW - the process they use that sets them apart. Very few leaders talk about (or even know) their WHY - the reason the business exists in the first place (hint: it isn't money…that’s a byproduct). Sinek argues that when we start with WHY in everything that we do, we inspire action in a way that WHAT doesn't. That’s because WHY engages our emotions, while WHAT engages our logical brain. The first response feels safer. But it’s also pretty boring. The second one is magnetic. By now, you should see the value of starting with WHY. But what if you don’t know your WHY? How do you go about finding it? First off, I’d recommend reading the book. Even though it doesn’t give much of a structure for determining your WHY, it does give some great examples. Reading about how companies like Apple communicate their WHY will help you articulate your own. Sinek points out that “Finding WHY is a process of discovery, not invention”. In other words, most of us already know our WHY at some level; we just have to find it. Look outwards. Ask a close friend why they spend time with you. Or ask a long-time customer why they buy from you. Once they understand that you're not being insecure, their responses will give you insight into why people are drawn to you or your business. They will highlight your common beliefs. Look inwards. According to Sinek, the best businesses have a point of view about the world, a bigger vision that they are contributing to. This doesn’t need to be philanthropic, but it does need to inspire. What commonly held belief do you disagree with? What gets you up in the morning? What really matters to you? If you're still not clear on your WHY, that’s okay. Like your purpose, passion, or niche, your WHY will emerge over time if you let it (you can also check out my True North Toolkit if you want to expedite the process). So, what’s my WHY? Simple. To unleash potential. Everything I do in my business aligns with that one purpose. I believe that untapped potential is one of the biggest tragedies in the world. When I was in high school, my friend Zack McLeod suffered a traumatic brain injury during a football game. They airlifted him off the field. He survived, but his speech and short term memory didn't. He was never able to make the same type of impact that he could have. After that happened, I made a promise to myself: I didn't want to ever look back with regret on things that I could have done, businesses I could have started, relationships I could have had. This promise is what finally convinced me leave the safety of my consulting job and start my coaching business. I didn't want to wait ten years to make an impact. I didn't want to put a cap on my potential. The truth is that most people will die with their greatest gifts still inside them. Not my clients. They're too busy starting and growing epic businesses that contribute to the world. Entrepreneurship isn't the only way to unleash potential, but it's one of the best HOWs that I've found. It forces us to be brave and slay our mental dragons. Plus, success in business is transferable to other domains. Coaching, writing, and speaking are simply WHATs for me. If I found a better way to unleash potential, I would do that instead. All that matters is that I create a spark.